Keep going by parlaying a passion into a successful home-based business. Here, we revisit some second act success stories. All it takes is an interest, an opportunity or an idea. Many retirees are finding that supplementing a pension with a home-based business is easier than they imagined. In fact, most would hesitate to use a four-letter word like “work” to describe their means of earning extra cash because they’re having so much fun. When Donna Smith of Noelville, Ont., took a course in entrepreneurship shortly after leaving Toronto for a rural lifestyle when she was in her early 50s, it opened her eyes to what she really wanted to do to earn money. Smith, a single parent, had spent the majority of her working career as a secretary and being told what to do. “The course showed me a different side of life and to love what you do. And I always dreamed of looking after animals,” she says. With a home on 80 acres, she was able to regularly board a dozen dogs at a time. Since selling that home several years ago and moving to a smaller property, she continues to offer pet-sitting on a comparative scale. Now, at the age of 72 with four dogs of her own, she often has two extra pets boarding with her plus she offers dog-walking services for a steady clientele in nearby communities. She charges a boarding fee of $15 per animal, which includes two walks a day – exercise she enjoys, too. Soon after starting her pet-sitting business, another opportunity came her way when she was asked by an acquaintance to teach piano to kids in the community. Though she had musical training up to the Royal Conservatory of Music Grade 8 level in her youth, Smith says, “I was nervous because I didn’t think I was qualified,” but she soon had five students in her first year of teaching. Now 14 years later, she has 17 students and charges $10 for a half-hour of lessons. While start-up costs for her businesses have been minimal, overhead expenses include gas in her tank to pick up animals, which, she says, helps put her in control of both the animal and her schedule and, since she prefers to teach in her students’ homes, this adds travel costs as well. Besides these part-time businesses, she also finds time to work 14 hours a week at two nearby libraries. Being active with pastimes she loves is important to Smith, whose income of CPP and OAS, she says, is only enough to live on if one is frugal. But her motivation for having extra jobs isn’t all about the money. “I like to have a reason to get up every day and to have somewhere to go,” she says. 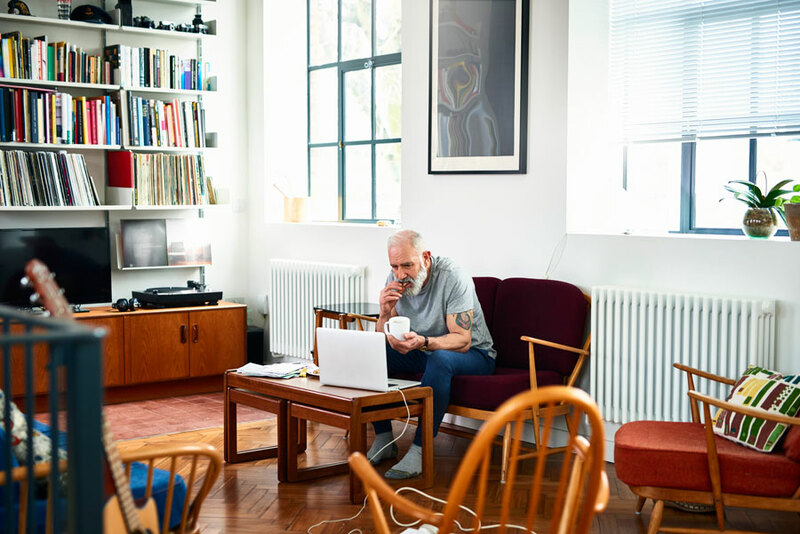 Ted White, 57, of Victoria also has a home-based business with music at its core, an occupation he hadn’t planned to be doing in his retirement years. White had spent the majority of his career as a marine biology instructor at the university level and then later as a consultant and part owner of a start-up company supplying equipment to the aquaculture industry. Though he admits, “I’m not a great musician – ask any of my friends,” White says the violin (a surprise Christmas gift from his wife, Katie) helped alleviate the stress from challenges in his work and the responsibilities that came with running a company with 30 employees. On the recommendation of his doctor to reduce the stress in his life – he was also diagnosed with bipolar disorder – he stepped away from his career as a business executive and opted for early retirement before he turned 50. “Retiring early was a real challenge, but it makes you think about what life is all about. Is it all about working for mega companies and making all this money? And then I realized, no, it’s actually more about playing the violin when you get home from work,” White chuckles. The perspective, he says, helped sort who he was and what he was capable of, and he’s a much happier person now. While he enjoys playing Celtic tunes with his fiddle, the violin led to his interest in the science behind the acoustics of the instrument. With his engineering background, White, who holds a number of design patents in the aquaculture industry, began fiddling with different designs and materials required in violin craftsmanship. Soon, he was building his own instruments and parts to sell to other musicians and luthiers (people who repair string instruments) around the world, and a home-based business was born. “I’m entrepreneurial so if I get interested in something, I try to figure out a way to make it pay for itself,” says White. As a member of the Violin Society of America, White specializes in research in composite green materials as alternatives to the traditional ebony species of wood (some are in diminished supply or on the endangered list). These exotic woods are often used for the part of the instrument called the tailpiece. White’s tailpiece allows tonal adjustment and the elimination of undesirable tones. Besides building his own violins, he does contract work in constructing instrument parts and providing the automated computer numerical control (CNC) machining that carves the majority of the wood for a musical instrument before a luthier finishes off the detailed design by hand. To fund his research and equipment, such as the CNC machine, which cost upwards of $60,000, he applied for and received a guaranteed loan of $60,000 through Industry Canada. And while he confesses the business is not a moneymaker yet, it has opened up opportunities to travel, make new friendships and share ideas with like-minded people in the instrument-building industry all over the world. “It’s just been a wonderful experience all around,” says White. Ineke Hughes, 66, of Salmon Arm, B.C., loves to travel. But without a big holiday budget, she began scoping out ways to save on accommodation because she prefers to stay at destinations for extended periods. Since she was no longer a homeowner, she didn’t qualify for a home exchange so she began to explore the option of house sitting. With the idea that others would be interested in the same information, she started a business to help match house-sitters with homeowners. The business grew from being a database she maintained manually in 2009 to a website in 2011. House sitters pay $40 for a six-month registration or $55 for a year. Homeowners register for free. Initial start-up costs were approximately $3,000 dollars for the website and, in her first year, her revenue was $1,300 plus she benefited from some small business tax deductions. Though Hughes’ database is for those living in her immediate locale, the Shuswap area, this year she plans to expand into the much larger Thompson Okanagan Region – an area in the interior of B.C. with at least 500,000 people, which offers a tourism and retirement lifestyle that draws people from all over. This, she says, will be her niche market. Hughes currently works as an office receptionist in a retirement facility and plans to retire at age 70. She spends less than five hours a week maintaining the business since most of the arrangements between sitters and owners are privately negotiated between themselves based on the information they submit on forms to the website. But she anticipates spending more time at marketing, revamping the website this year and continually expanding the business. “I’m hoping this will eventually be another stream of income to supplement my pension,” says Hughes. Her advice for others considering a home-based business? “Choose something you like and that you’re interested in and not in terms of this is going to make me tons of money. And be aware of your limits for risk. I was older when I started [this business] so I had to weigh all those things very carefully,” she advises. Revenue from a home-based business can sometimes come from the home itself. “I live on two acres in the middle of a beautiful town in a beautiful province in the best country in the world – this is worth sharing,” states Gerri Kiy, also of Salmon Arm, B.C. At 55 years of age, she embarked on a plan to turn her home into a bed-and-breakfast accommodation. Referring to it as her segue to retirement, she anticipates it will supplement a pension at age 60 when she retires from her job as an education support worker. Her home had already undergone a renovation and an expansive addition of another living area with 10-foot ceilings and skylights when her husband was diagnosed with ALS in 2006. He required a space that was cheery with lots of natural light and a large bathroom and shower that was wheelchair accessible. When her husband passed away a few years later and her children were no longer living at home, she made plans to use the extra space to operate a wheelchair-friendly bed and breakfast. She added an accordion-style wall partition to section off the area for guests from her private living space and a level concrete driveway and pathways for easier access. Kiy registered her Twin Trees B&B with BBCanada.com, using the Canadian directory as her primary advertising source and had six nights booked her first summer of 2012. The suite has also generated revenue as a short-term monthly rental in the winter. By her second year, her guest list for reservations had more than tripled from her first year of operating, and she is hopeful this trend will continue. Her nightly rate of $115 includes a full hot breakfast on weekends. “One of the benefits of the B&B is that if I want to go away myself, I can choose not to take guests. There’s no overhead because it’s my home. It will always be an augmentation of my income,” says Kiy. Sharing one’s home with others is something Susan Carr, 63, of Fort Langley, B.C., enjoys as well. When Carr bought a piece of property along with her two sons in 2006, the original intent was to have a place for family get-togethers a few times a year. Instead, it’s also become a successful vacation rental. The location of Valemount, B.C. – a tiny community tucked between the Rocky, Monashee and Cariboo mountain ranges – was chosen by her son who lives in Alberta and is a halfway point for the rest of the clan who live in B.C. When Carr retired five years ago from her job as a medical transcription supervisor at a hospital, she sold a property in New Westminster, moved to Fort Langley and decided to invest in the Valemount property, building a home for a meeting place for her and her sons. “There happened to be a log home builder next door who came up with the suggestion of building a vacation rental home because there were so many snowmobilers in the area,” says Carr. As well, he and his wife were willing to operate and maintain the rental for her. “So I took a flying leap of faith and said here are the keys. As it turned out, the place has made quite a bit of money,” says Carr, whose home she calls The Legacy, is booked almost nightly from December to March. With rates of $175 to $200 a night depending on the length of stay, Carr earns revenue of $25,000 a year after paying management expense and maintenance fees. “It started with a dream to have a place for my children to get together, and I’ve ended up with this,” says Carr, who never expected to make money from the property and to only go there a few times a year. “This has been perfect because the home is looked after the whole time I’m not there.” The success of the vacation home rental inspired the builders, Shawn and Diane Fowler of Whisper Creek Log Homes, to build another home of their own to rent out and has led to the building of 10 more for others in the same neighbourhood. In addition, there is a future proposal for a large glacier ski resort to be developed nearby that will offer year-round skiing – the first of its kind in North America. Carr expects this will add further revenue and value to her investment and the community as a whole. As Carr reflects on what it means to enjoy retirement and pursue her interests, she describes some of her current freelance gigs: she writes and photographs walking routes in Vancouver complete with GPS co-ordinates for cellphone apps, works as a casting extra in the movie industry and does volunteer work in tourism that has led to paid freelance work.